Ace: Frank C. Hearrell Jr.
Frank Clint (Sack) Hearrell Jr. was born on 2 August 1921 in Bronte, TX. He graduated from Long Beach Junior College in California and enlisted in the Navy as a seaman on 4 March 1939. 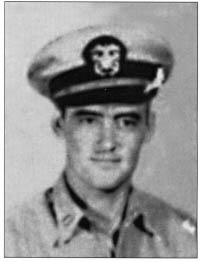 In September 1941 he entered the Navy light training program at Pensacola, FL as an aviation cadet, graduating on 14 March 1942. Following a tour as flight instructor at NAS Los Alamitos, California, in August 1943 Hearrell joined VF-18 flying F6F-5 Hellcats. The squadron boarded the USS Intrepid (CV-11) for combat in the Pacific in August 1944 and participated in numerous aircraft strikes against Japanese forces in the Philippines, Palau Islands, Formosa and Okinawa, and the historic battle for Leyte Gulf. Lieutenant Hearrell’s first victories came on 12 October 1944 when he downed two Zeros and a Lily bomber near Taien Airfield on Formosa. He became an Ace on 24 October when he splashed a Jill and a Frances in the Philippines. Remaining in the Navy after the War, Hearrell served on an exchange tour with the Air Force at Nellis Air Force Base from October 1949 to October 1950. From November 1951 to February 1953 he commanded VF-871, of Air Task Group Two, aborad the USS Essex (CVA-9), leading his squadron in 52 strikes over North Korea. Promoted to commander on 1 July 1954, he commanded Training Squadron Two (VT-2) at NAS Whitting Field, Pensacola, FL from August 1958 to June 1961. Retiring from the Navy in October 1965, Hearrell graduated from Corpus Christi State University in 1975 with a bachelor’s degree in business administration.